SEO : Search Engine Optimization, Every blogger knows well, how important is SEO for any blog as It helps in gaining high search Engine Rankings, which will obviously increase your targeted traffic. LSI means Long-tailed keywords which is essential for any post to get high SERP, so guys, Recently I used Hittail, and to be honest, I dont use many SEO tools, but after using Hittail for a week, I can simply say – Hittail is best tool to get list of keywords that drives traffic to your site most. As, I previously shared High PR dofollow backlinks list, which will also help you in getting high ranking for compeitive keywords.Every Blogger wants there site on First rank for particular keywords, then think How difficult It would be to get Rank on Google with such tough competition. To be honest, I have used Hittail for only 1 week, but after using this tool for one week, I am totally amazed, after checking stats of my site. My organic traffic was increased upto 30%. Shocked? Yes! I was also shocked after checking these amazing results.I got this boost simply by adding keywords and by creating articles on some particular keywords, which was coming in my suggestion box. The best thing which I like of this tool is that I am getting higher ranking or SERP for some particular keywords. Long tail keywords: The best thing of this tool is that It will provide you latest as well as best LSI keywords for your site, in keywords section. You can simply add them in your existing article or you can simply use these keywords for your new article. Daily traffic report: Though, this tool is to get LSI keywords but it will also track the keywords for which you are generating traffic from search engines. It will also notify you about number of clicks for any particular keyword. Article creation: This tool also provide a feature about article ordering. To be honest, I havent used this option in Hittail, but still its a good option for beginners bloggers who want to get rankings for any article. Hittail will create an article for you by keeping all things in mind like Keywords density and other things. Hittail has different types of pro plan, but still you can give it a try as It allows one import for a new account,which enables you to receive 15 keywords and suggestions, which is enough for any beginner to learn this tool, or to try any feature of Hittail. Depending upon, your blogging level, you can signup for any Hittail plan. After, creating an account on Hittail, simply add your website in webmaster tools and have to add a tracking code (which is optional). Click on Manage site (In side of your site Address). Click on Add a new user & Paste this to box : [email protected] . In your blogger dashboard, navigate to template section and click on Edit HTML. Note : Create a backup first of your template to prevent any kind of problem. After, clicking on Edit HTML, just search for “</head>” (Remove quotes before searching). Just paste the code above </head>, and click on Save template. WordPress users can simply use Hittail wordpress plugin to use this tool quickly, without any problem. Suggestions : In this section, some words are shown with some stars, which denotes about the ranking. (Maximum stars means, maximum number of your chances to get on first page of search engines). You can simply add any keywords to your To do list, by clicking on them. To do: The keywords which you have added to your to do list by clicking on them is added to your to do list. After, publishing an article for any keyword, you can simply, click on Tick to remove keyword from to do list. My hittail : This section will notify you about keywords from which you are generating traffic from search engines. 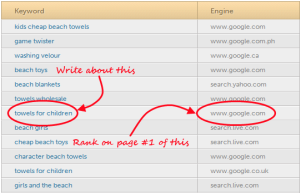 It will also show you your TOP 10 keywords which brings you most of traffic. Keywords : This section will show you the keywords on which you have attained traffic from search engines,which will be very helpful for any blogger who want to know about every keyword details like ranking etc. You can also Export list of your keywords in Excel file by clicking on Export to Excel option. Search Hits : It will show you the sites from which you have generated traffic. In other words, this section will notify you about referral sites which brings you traffic, it can be Search Engine or any other site. Article : In Article section, you can order any article for any keywords for 19$. So, this was all about Hittail and its features. I think you should give it a try once. This tool is simply best tool to manage your organic traffic rankings.Visit Hittail now. Top Social Bookmarking Sites You Should Know! 13 On Page Optimization Techniques That Give Big Results! 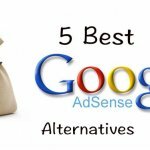 Best Google AdSense Alternatives For Making Passive Money!